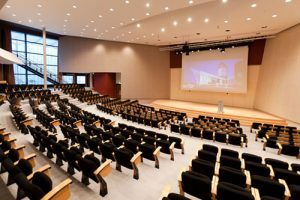 De Doelen is a highly acclaimed concert hall and state-of-the-art conference center. In the Netherlands, De Doelen is the largest venue combing these two functions. It is centrally located in the Mauritskwartier district of Rotterdam, within 200 meters from Rotterdam Central Station. With a capacity of up to 3,000 visitors, de Doelen hosts both large international conferences as well as intimate symposiums. 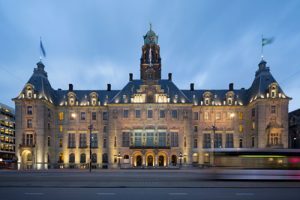 The conference venue is located only 200 meters from Rotterdam Central Station. Paid car parking is available in the parking garages located next to the venue. The City Hall was one of the few buildings to survive the bombardment in 1940. Queen Wilhelmina laid the first stone in 1915. The listed building in Beaux Art style with Byzantine, Roman and Art Deco influences is symmetrically structured around an inner courtyard which can be reached via the street that ‘intersects’ City Hall. The richly decorated façade features various sculptures. The mayor’s office is on the first floor of the right corner pavilion. The Steamship Rotterdam is the biggest ocean-going steamer ever built in the Netherlands. As the former flagship of the Holland-America Line, this cruise liner has sailed many of the world’s seas since 1959. 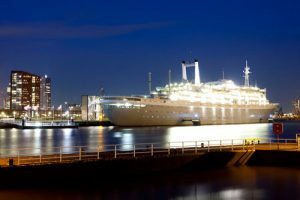 The ship is now moored permanently in the Maashaven in Rotterdam, by Katendrecht. The ship’s history is palpable at every turn once you come aboard. From 2005 to 2008, the 1950s interior and the many artworks were restored to the closest possible approximation of their former glory. However, the hotel rooms, restaurants and other facilities are fully adapted to modern conveniences.